I am writing this series of posts for two reasons. First, to document what I am doing along this blogging journey and second, to help anyone else out there who wants to create a blog but doesn’t know where to start. About 5 years ago I started blogging. My family and I moved to England for a year and I thought it would be nice to document my first time away from family and friends. At the time I thought blogs were just an online journal that no one would see unless they stumbled upon it. So I started a blog about my experiences and travels in a new country. That lasted about a week. Then through the years I started about 5 to 10 other blogs… all on Blogger.com…because it was free and I didn’t know what I was doing. They all had different names and subject matter because I didn’t know what I was truly passionate about at the time. And guess what? I still don’t know what one subject I’m passionate about because I’m very interested in many things. That is just who I am. So last year I got serious about this blogging stuff and I bought a Word Press account. The real blogging has begun and in this 2 part series I will share with you what I have learned so far. So are you ready for STEP 1? What do you want to write about? Do you want to write about cars, food, fashion or your 2 year olds antics? Whatever it is it has to be something that you enjoy writing about. I hate to use the word passionate because I am simply not passionate about just one thing, and you might be like me so just make sure it is something you really enjoy writing and learning about. Because any subject you choose to write about will change and evolve as time goes on and you will be learning and growing too. Now that you have your subject matter let’s move on to STEP 2. Let’s say you want to write about All Things Pickle. Your domain name and your blog name don’t have to be the same but it’s easier and more cohesive if they are. Your domain name is your URL (http://www.yourblogname.com). 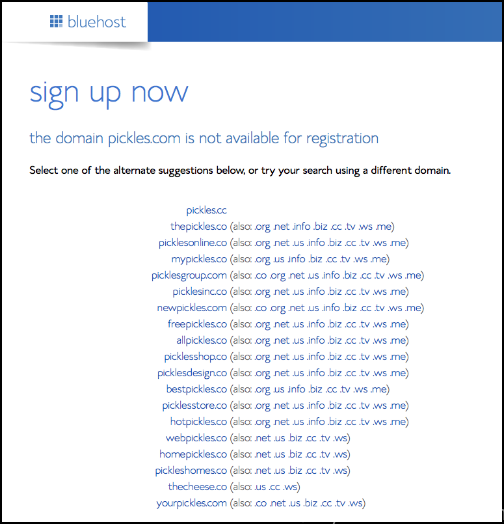 So in this example my blog would be called All Things Pickle and my domain name would be allthingspickle.com. I would highly recommend that you use a .COM domain rather than a .NET (other options are .CO, .ORG, .US, .BIZ, .CC, .TV, .WS, .ME). That’s just my opinion but it looks more professional. Make a list of keywords related to your blog idea. Check out other related blogs and websites for catchy phrases and ideas. Sit down with your friends and family and have a brainstorming session. Jot all your ideas down even if your heart is set on only one name, because that domain name might not be available. How will your blog sound to others when you are describing it? What would your social media names be (@allthingspickle)? How does it look written without spaces (allthingspickle.com)? One last thing to think about when picking your blog and domain name… pick one that will grow with you. If you pick a name like Little Mikey’s Antics, what will you write about when he grows up? If your goal is to be doing this for a long time and possibly make money at it, keep this in mind when picking your name. Also down the road you may want to brand it. Back to our example, let’s look to see if ALLTHINGSPICKLE.com is available. You can check out your domain name here at Bluehost.com. (Note: I use Bluehost.com for hosting my site and I highly recommend you do too. I”ll talk more about that later.) For now just pick a subscription package which will land you here to see see if your domain is available. Hurray! All Things Pickle.com is available. Let’s try Pickles.com just to see what we get. As you can see that they give you a lot of different options. Maybe one of them will work for you. Maybe not. I suggest you really brain storm about this for a few days to get the right blog name for you. You can’t go back and start all over. Actually you could but it would be very difficult. Getting the right blog name from the beginning will make everything run smoother so take your time here even if you are anxious to get started.